Sloggers, proudly made in USA, perfect for outdoors! I got my Sloggers yesterday & am loving them! I wore the shoes for 4 hours today while working at my Dad’s Greenhouse & they’re perfect for working their for sure as I’m dealing with water & dirt daily. They don’t come in 1/2 sizes so I got the 9’s & the shoes are slightly big with very thin socks on, 8 1/2 would’ve been perfect for me for those. But the boots are perfect as a size 9. I put them on & my Son immediately said “Mom, lets go find some puddles”, which we did & had a lot of fun stomping around! I loved all the cute designs they had to choose from! I can’t believe I just found out about this company a couple weeks ago, thanks to a post in this page! They have a great label displaying how proud they are to have been making shoes in the US for 60some years! They come in many adorable patterns. Info from the company: “They are Latex Free and “Vegan Friendly” but they are made out of Medical Grade PVC. Also, please keep in mind that our material is prop 65 compliant, meets and exceeds ALL federal and state safety regulations, INCLUDING the most stringent CSP regulations for children’s toys and pacifiers (not that you were planning on letting your child teeth on a pair of Sloggers! Although dogs do sometimes, so it’s good to know that they are safe!). I hope that helps answer your concerns.” I really appreciate this fact too: Commitment to Sustainability:In addition to utilizing Best Manufacturing Practices (BMP’s) regarding the environment, Sloggers attempts to maximize the amount of recycled material they put back into their shoes. Currently, they can add up to 50% of mixed recycled material in their soles, and they are able to use 100% of the clear material scraps back into the uppers. The company also encourages you to send your shoes or boots back to them when they have finally reached the end of the road. They will grind them up and add them back into a new pair of shoes.”! Those look really nice! I will keep those in mind. I need rain and winter boots since my boggs are about to wear through. 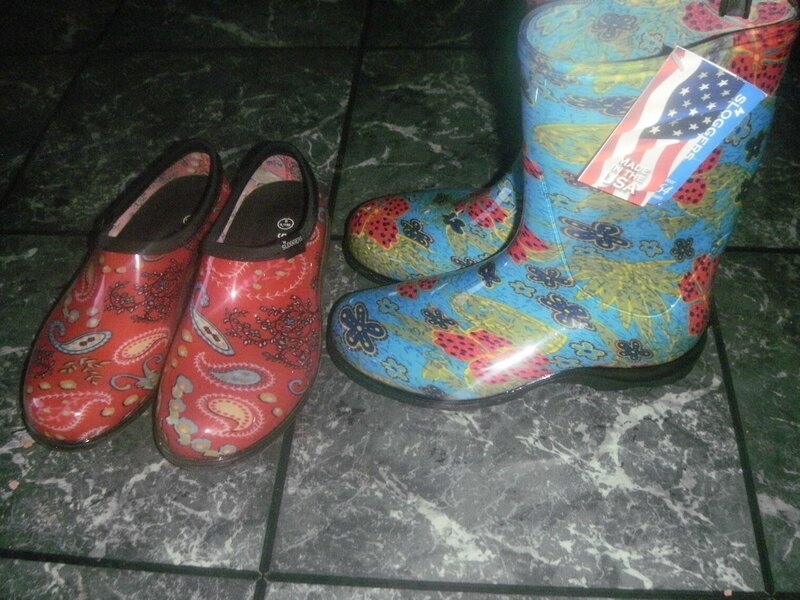 Do you know of a good kids option for rain boots? How do I figure out which are made in US or Cananda? I like those a lot. Everything on my lists is US made! I believe you said some of the boots are US and some CA. I can’t find my way back to the post to clarify. I don’t like buying online, especially shoes, so it is unlikely I will be getting any. I will need to come up with a rain boot solution for my son soon though. Oh yes, sorry I didn’t realize the comment was on this post! I did write to Kamik & ask for a list of what is made in Canada, US, China & they did not respond…. I just received my Sloggers via Amazon! So great! I haven’t had rain boots in I don’t know how long, but I’ve certainly needed them lately (Texas). I couldn’t get over how inexpensive they are, and so comfortable. Could you please please tell me of a company with shoes for toddlers, specifically with something that is water friendly for the pool and beach? I have looked over your website (which I love and am so glad to find) and cannot find mention of shoes for kiddos. And I have searched tirelessly on the internet without success. Thank you!